Ise udon are thick and soft flour noodles served simply in a sweet, soy-sauce based broth. For generations, Ise udon has been a sought after, simple delicacy for pilgrims and travelers to Ise City. Fukusuke serves Ise udon in their mild and smooth, original recipe Ise udon broth made from dried bonito and kombu, perfect for first-time eaters. 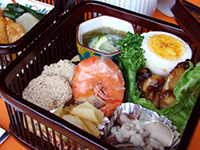 Dangorojaya serves Japanese staple foods throughout the year including buckwheat (soba) noodles made from high-quality buckwheat from Tokakushi, Nagano Prefecture, rice balls (onigiri) made from flavorful Shonai rice in Yamagata Prefecture and world-famous Matsusaka beef, cubed and barbecued on a stick. Visitors should also look for seasonal favorites at Dangorojaya like their green tea, tangerine or melon flavored shaved ice in the summer and piping hot sweet bean soup in the winter. Butasute has been one of Ise’s finest beef butchers since 1909. 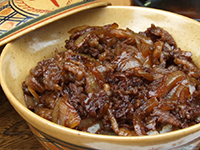 At Butasute’s restaurant, diners can enjoy simmered beef and onion over rice (gyudon), slow-cooked beef and vegetables (sukiyaki), grilled beef (yakiniku) and beef hot pot (gyunabe). 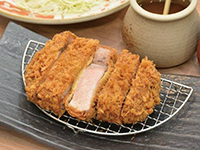 At Butasute’s butcher shop near the entrance of the restaurant, customers can purchase choice cuts of Japanese beef and their long- selling and popular beef croquettes to go. Year-round, Ebimaru serves locally caught, hearty seafood and seafood dishes such as their fisherman’s miso soup, made with clams, white fish, shrimp. During the spring and summer, fresh abalone and octopus are served and during the fall and winter, local Ise lobsters and succulent oysters are on the menu. Choose to have your Ise lobster or abalone prepared sashimi-style or grilled and Ebimaru will select the finest from their on-site tank to fill your order to perfection. Starting in the early Meiji period (late 1800s), when Japan first began opening to Western influences, some of the new kinds of foods that were introduced are still big crowd pleasers today. 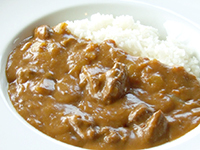 At Haikarasan, a few of those favorites are on the menu such as their hashed beef rice or Hamburg steak, both served with their special recipe, in-house demi-glace sauce. And be sure to top off any meal with one of Haikarasan’s delectable sweets and tea or coffee for an enjoyable rest during your time at Okage Yokocho. Yokocho Soba Shouseiko ramen shop is located on a small side street in the heart of Okage Yokocho. Yokocho Soba Shouseiko uses Chinese-style noodles first introduced to Japan in the early 1900s. Yokocho Soba Shouseiko serves their ramen in a delicious soup stock that has been slowly simmered for up to a week that is made from Matsusaka beef, pork, chicken and an assortment of vegetables. All ramen orders are topped with a hearty slice of Yokocho Soba Shouseiko’s famous, locally raised, slow roasted and meticulously prepared pork. The Fruit Lab serves up freshly squeezed fruit juice made from deliciously ripe, high quality seasonal fruits. The Fruit Lab makes all their creations with a special kind of juicer that maintains the fruit’s nutritional value and extracts the true essence of each fruit resulting in a refreshing and healthy treat. 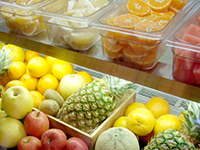 In order to maintain peak serving conditions, all juices at the Fruit Lab are made at the time of ordering. The Fruit Lab also serves hot soups during the cold winter season. There is an old Japanese adage that says people “shouldn’t let tofu travel,” meaning that freshness is key for this bean curd delicacy. Tofuya restaurant firmly believes this and that is why their handmade tofu is always created within the restaurant, using only carefully selected and domestically grown soybeans. 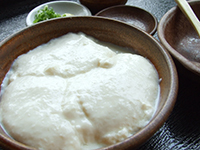 Diners can enjoy their tasty yose-tofu, different varieties of tofu mixed with seasonal vegetables or their popular and scrumptious grilled or deep fried conger eels served over rice. 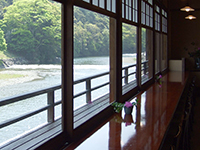 At Tofuya, diners can enjoy their meals while taking in the peaceful views of the Isuzugawa River and the mountains surrounding Naiku Shrine. Please note: Tofuya is not open for dinner on Wednesdays and the first day of each month. 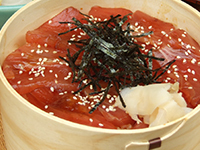 Sushikyu serves fresh and flavorful Ise Shima cuisine. 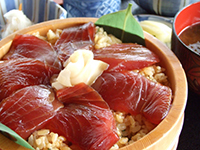 Sushikyu’s most popular menu item is tekonezushi, thick slices of bonito seasoned with soy sauce and mixed by hand with vinegary rice. Some of the wood used in Sushikyu was gifted from Ise Jingu in 1869 as part of their rebuilding ceremony, shikinen sengu. To this day, Sushikyu continues to play a special part in Ise’s rich cultural heritage. Please note: Sushikyu is not open for dinner on Tuesdays as well as the first day and last day of each month. 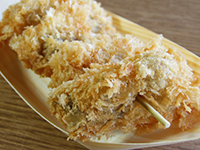 Yokochoyaki no mise’s grilled cakes are filled with sweet bean paste and are a delicious treat for both young and old. At Yokochoyaki no mise, their grilled cakes are shaped like Ebisu Daikoku, the Japanese god of prosperity and wealth making it one of Okage Yokocho’s lucky foods. 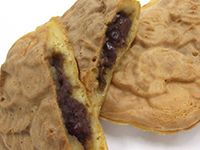 The sweet bean filling at Yokochoyaki no mise is made from high quality adzuki beans grown in Tokachi, Hokkaido. In the fall and winter, Yokochoyaki no mise serves their grilled cakes filled with velvety sweet potatoes. And to beat the summer heat, customers can try strawberry, mango, green tea and sweet potato flavored ice cream cones. 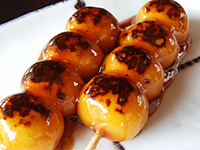 Dangoya serves only classic Japanese mitarashi dango – grilled rice flour dumplings on a stick. With flavors such as sweet soy sauce, brown sugar, lightly roasted soybean powder and rich soy sauce, Dangoya serves this soft, sticky and uniquely Japanese traditional sweet like no other. 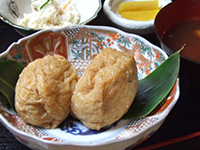 All of Dangoya’s dumplings are grilled directly at their shop so there is always an aromatic grilling scent in the air. Visitors can eat their dumplings at Dangoya’s shop or take them to go. If you are looking for a quiet moment and a superior cup of coffee, visit the Isuzugawa Cafe where all the tables give a peaceful view of the beautiful Isuzugawa River. The Isuzugawa Cafe uses only choice coffee beans and a traditional style flannel drip filter that produces deliciously smooth and rich coffee. All coffee is prepared at the time of ordering so it is always fresh and delicious. Take a moment to relax with a freshly brewed cup of coffee and a piece of their homemade cake or other delectable sweets. Roukyokujaya restaurant is located near the west gate of Okage Yokocho with a playful dancing cat statute near the entrance. 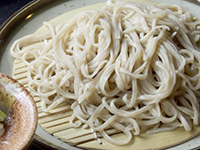 Roukyokujaya serves extra thin, hand made flour noodles called somen often served chilled with a light and flavorful dipping sauce for a refreshing summer meal. 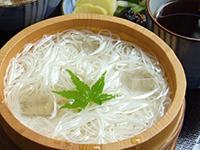 In the colder months of fall and winter, the somen are often served in a flavorful bowl of hot soup called, nyumen. Roukyokujaya also serves a terrific selection of locally brewed sake from Mie Prefecture. In the background, diners can hear Roukyoku, traditional Japanese storytelling music. Every morning, Yokocho Kimiya’s top sushi chef hand picks seafood from local fish markets for that day’s menu. Choosing only the finest and freshest the sea has to offer, most of the seafood at Yokocho Kimiya comes directly from Ise Shima. 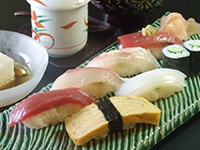 Yokocho Kimiya serves seasonal seafood prepared in nigirizushi (hand-shaped sushi) style. On the first floor, diners can enjoy counter seats to watch the sushi masters at work or relax on the quieter second floor with a view of bustling Okage Yokocho below. Please note: Yokocho Kimiya is not open for dinner on Wednesdays. Also, reservations must be made after 20:00. At Isekadoya Beer restaurant, diners can enjoy mouthwatering raw, fried or grilled oysters throughout the year. During the winter months, Isekadoya Beer restaurant happily serves famous Uramura oysters from neighboring Toba City and during the summer months, fresh Rock oysters are on the menu. And Isekadoya’s original, award winning craft beer, Sinto Beer, is proudly served year-round. Please note: Isekadoya Beer restaurant closes at 15:00 every Thursday. In Japanese, the phrase noasobi roughly means “to play in a field.” Noasobidana restaurant and cafe is located just a few minutes walk from Okage Yokocho in a relaxed, natural setting along the Isuzugawa River. Here, visitors can unwind from their busy schedules and enjoy a meal or refreshment. From the large windows at Noasobidana, visitors can take in some of Ise’s seasonal natural beauty such as cherry blossoms in spring, the clear passing water of the Isuzugawa River in summer, the changing leaves on Mount Kamiji in autumn and the migratory birds passing in the clear blue sky overhead in winter. Please note: Noasobitana opens at 10:30 on Saturdays, Sundays and national holidays. In Japanese, the word mame means “bean” and specifically at Mameya Restaurant mame means soybeans. Mameya restaurant focuses on locally farmed, hand-made, soybean and vegetable- based meals including tofu, fried tofu, miso and pickles from neighboring Seiwa Village. Opening hours: 11:00 to 16:00 on Saturdays, Sundays and national holidays only. Please note: Mameya is closed during the New Year’s holiday, planting season and harvesting season. 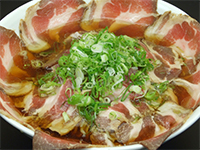 Okage Yokocho Mokuton restaurant is a store specializing in pork of Iga no Sato Mokumoku Tezukuri Farm in Iga City.